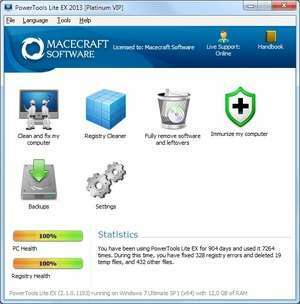 PowerTools Lite is the freeware registry cleaner offered free-of-charge from MaceCraft. It performs the most basic registry cleaning functions such as removing junk entries, outdated references to resources which no longer exist, entries which might be causing errors in Windows and it is all done as a one-click operation. As MaceCraft also provides commercial and shareware applications, it is probably a point to note that the engine behind their freeware registry cleaner is the same as that which powered its bigger brother, the jv16 PowerTools product. PowerTools Lite also offers users the function of undo (so, cancel your previous action), restore deleted files and of course restore your registry from a previous backup. Version 2.1.0.1201 is a freeware program which does not have restrictions and it's free so it doesn't cost anything. For security reasons, you should also check out the PowerTools Lite EX 2013 download at LO4D.com which includes virus and malware tests. Additional screenshots of this application download may be available, too. Featuring the very best in free system cleaner downloads. Editing staff adds reviews and free download links and constantly updates software. Check out some of the freeware downloads available in the system cleaner category. They contain no strings and are available at zero cost. 4.5 out of 5 based on 51 ratings. PowerTools Lite 2011 download been highly rated by our users.